Mestre? 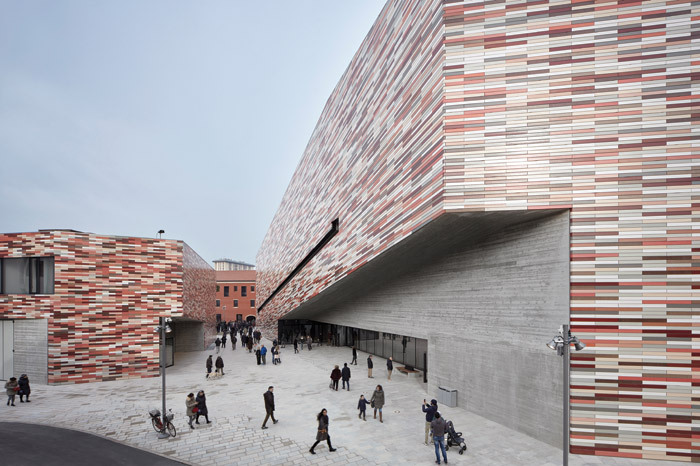 Why on earth would you build a museum in Mestre? 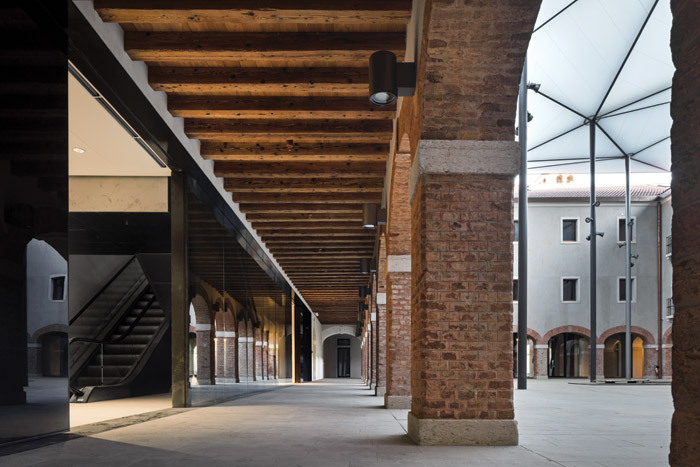 !’ was a typical response to my proposed trip to see the new €110m (£96.5m) M9 Museum just completed in the sprawling mainland conurbation closest to Venice. True enough, Mestre suffers badly in comparison to the iconic cluster of islands that glimmer over the water; then again, most towns would. But given its high speed links to La Serenissima — just a 15-minute car, train or bus journey across the Ponte della Liberta (Freedom Bridge) — Mestre has long been the back-of-house that makes the stage set of decaying, picturesque decadence that is Venice possible. Here is where nearly all of its workers are housed. One of the six boroughs of the commune of Venice, Mestre is Italy’s most populated. An estimated 250,000 people are concentrated in this mainland area, most of them working in tourism, the nearby docks or the petrochemical industries of Porto Marghera; which means there is wealth here. And a growing number of budget-conscious tourists are electing to stay here too. But Mestre has never been a destination in and of itself — though now, perhaps it could be. 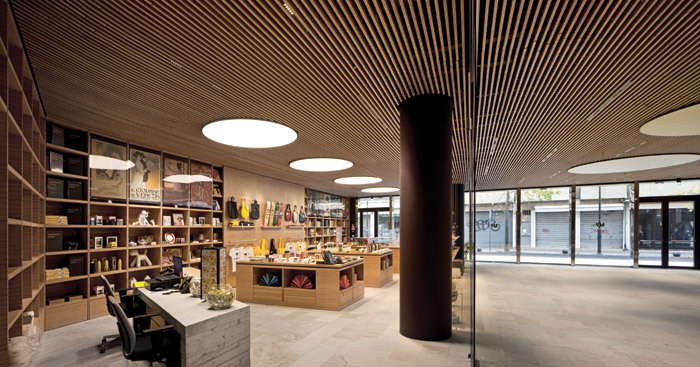 Where once there were walls around a disused military barracks in the centre of the town, Sauerbruch Hutton’s M9 Museum has materialised — like some kind of science-fiction, ceramic-tiled spacecraft — in two triangular slabs, set within whole new pieces of public realm. Between their sleek, scaly contours, a new diagonal pathway is delineated, connecting the surrounding streets to an area that had been off limits for centuries. Prior to its military appropriation, this was a working convent, whose main building has also been transformed and opened up to the city. In fact, it was the ancient path north to south across the courtyard of this 16th-century convent (the Convento Santa Maria delle Grazie) that Louisa Hutton and Matthias Sauerbruch realised could unlock this neighbourhood, continuing it via their new museum. The convent itself is repurposed for uses that complement the creation of a new, tech-friendly, creative quarter, with shops and cafes at ground level and timber-ceilinged co-working spaces along the first and second floors. 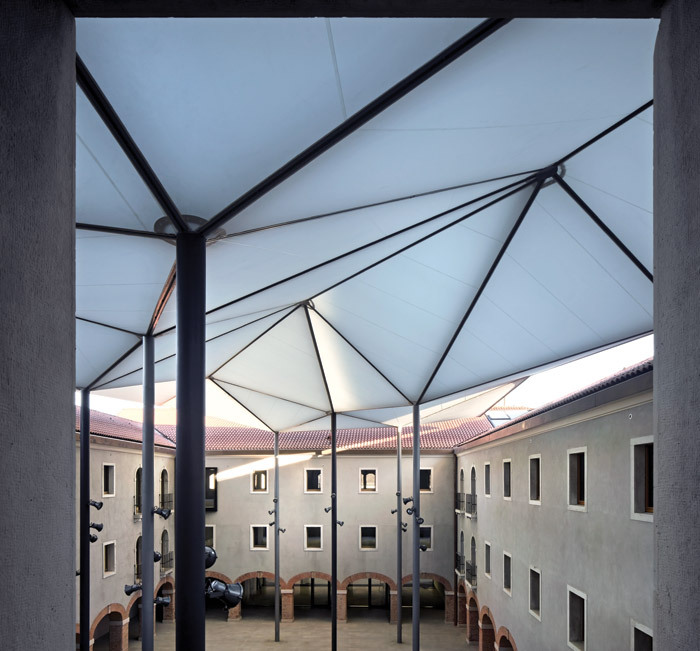 Its central courtyard now becomes a small, all-weather public piazza, lightly roofed over with the irregular geometries and semi-translucency of Sauerbruch Hutton’s ETFE parasol. 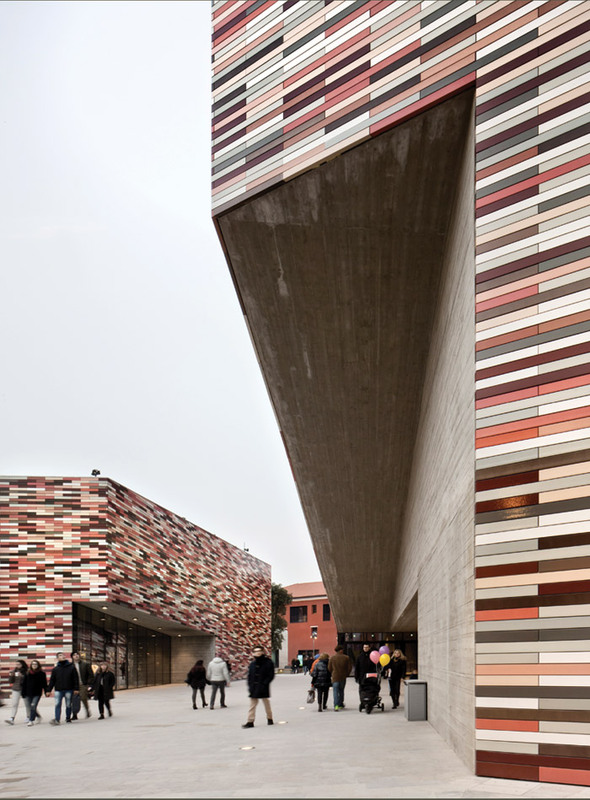 This creation of new public realm and connections — carving new pathways and activating old ones — is one of the many clever things Sauerbruch Hutton has done with this project, which it won through an international competition in 2010. Others include breaking down the massing of the museum into chunks that complement and reflect the proportions of the mixed bag of buildings around it — from the former convent to a 1960s office block. This the practice has done by splitting the administrative and delivery elements off from the galleries and public areas, and diverting these underground. Museum deliveries arrive to the rear of the smaller building, which has the museum offices above. Goods are then transported to the main building via an underground passage, which emerges at the lifts to the upper floors; these also serve the spacious basement cloakroom, toilets and locker areas adjacent to the auditorium. 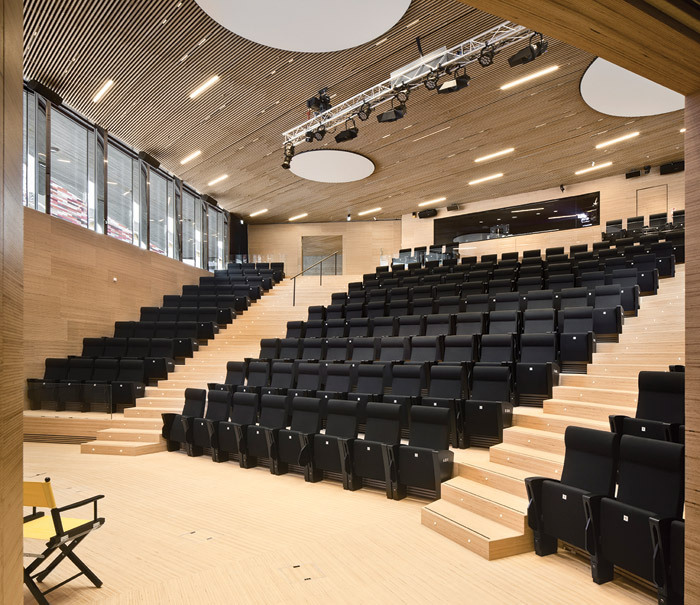 The 200-capacity auditorium declares Sauerbruch Hutton’s intention to make these buildings as social as possible: gouged out of the most prominent, public-facing corner of the building’s apex, seating descends in diminishing circles to the basement level. The auditorium’s two exterior walls are lavishly glazed at street level (though windows of course feature black-out blinds for screenings). Reflections cast by the polished chrome window surrounds amplify the two-way conversation between the museum and the shop fronts across the street; now shoppers can enjoy vistas into the building, and vice versa, where once there was only the blank face of the barracks’ brick wall. Thus the museum’s activities are woven into Mestre’s daily, pedestrian life. 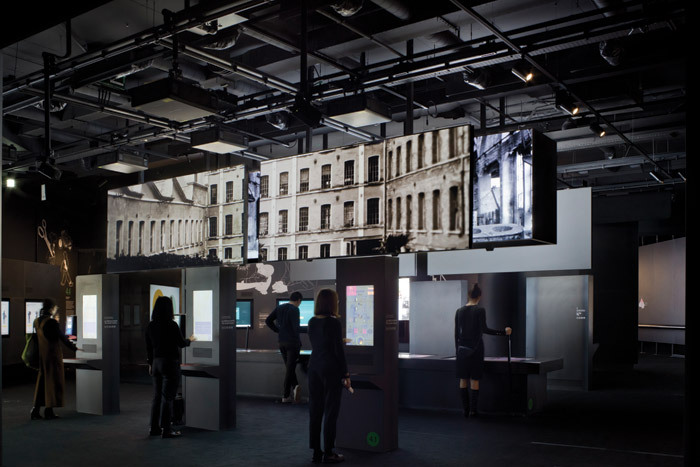 Three exhibition floors are housed above the ground floor with two dedicated to M9’s chosen subject of 20thcentury Italian history, told entirely through digital media. Across these black-walled, windowless 1200 sq m spaces, an absorbing array of screens, VR headsets, interactive consoles, projections, holograms and monitors are clustered according to subject matter, in a carefully orchestrated choreography of topics and technology. From changing Italian lifestyles to politics, from food to the battles between church and state, it’s all quite winningly presented, even for a non-digital native. This black box requirement for the two main floors is what allows for the second and third floors’ wraparound ceramic facade — no windows are necessary or indeed wanted on these levels. 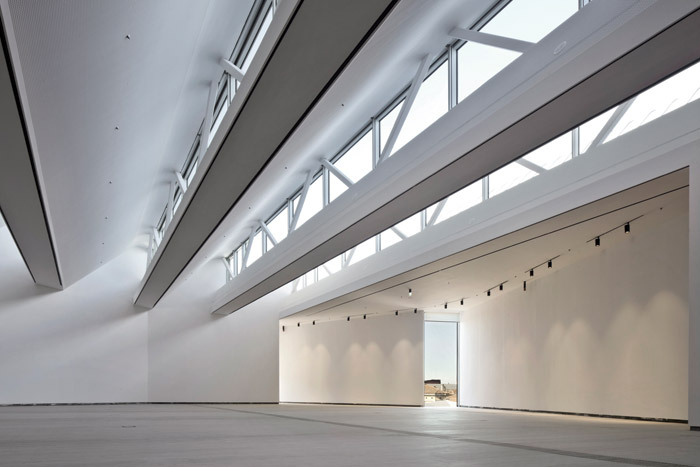 But the third floor is something else: a vast, top-lit gallery, its column-free footprint made possible by 40m beams which march across its roofline. 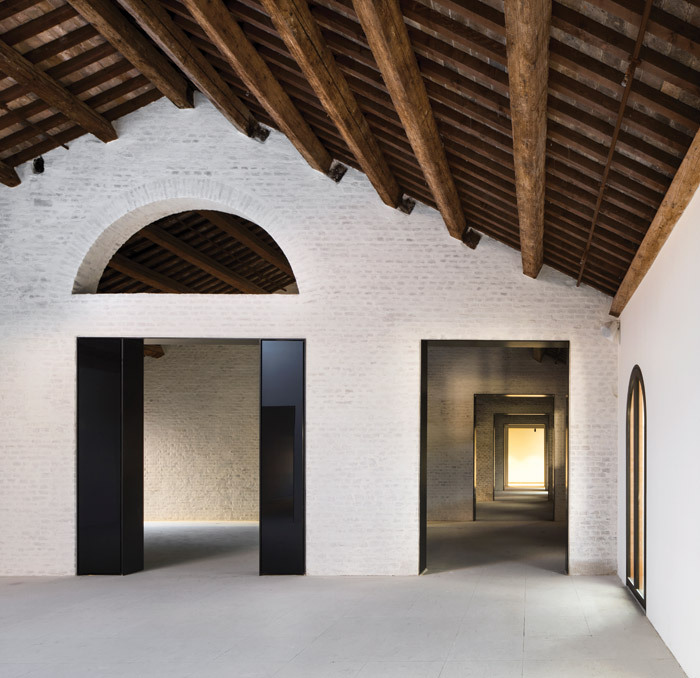 It is, as Matthias Sauerbruch claims, ‘probably the best exhibition space in Venice.’ It’s no doubt true that in the more ancient and picturesque parts, there is nowhere that combines these generous, column-free dimensions and filtered north light — which pours through the huge rooflights — along with the latest environmental standards, state-of-the-art technology and speed and ease of delivery. 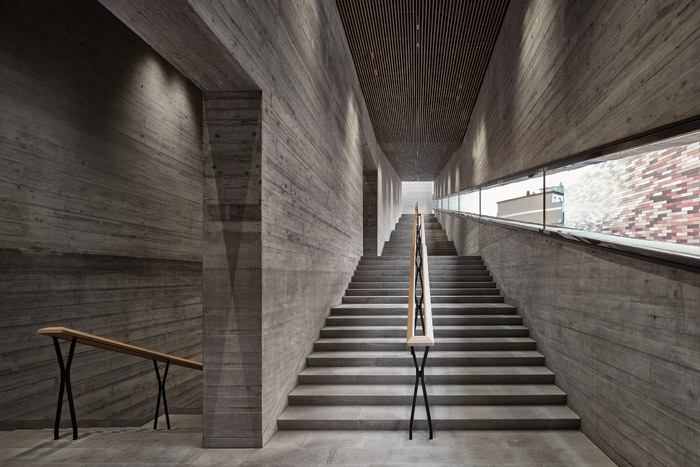 All four floors — even the basement cloakroom and auditorium lobby — are accessed via a wide and gracious staircase which zigzags up the side of the building, its first and second level expressed in cantilevered ramps that protrude to form a canopy over the main entrance. Daylight washes over the upper stairs via the aforementioned rooflights, and a horizontal lightwell. 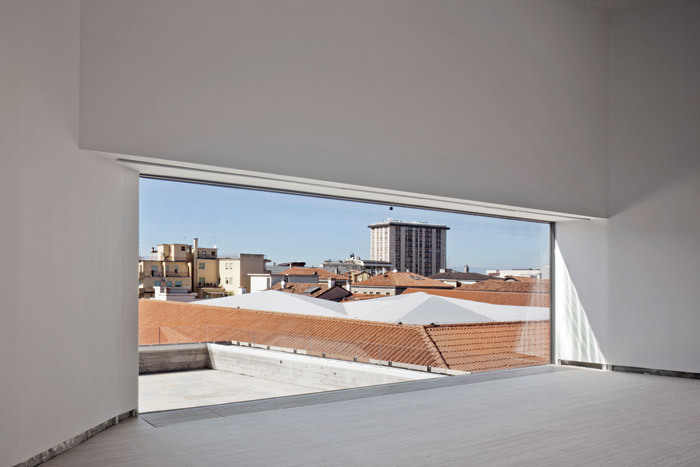 Below, from ground to first floor and up to the second, a long, slanting window draws the eye upwards with a vista that starts at the richly coloured ceramic tiles of the museum’s smaller companion opposite, taking in the wider Mestre roofline until it reaches sky and clouds. Via this and a range of other decisive incisions, Sauerbruch Hutton has ensured that this building embraces its surroundings, in ways that are strategic and immensely thoughtful. One of the most dramatic moments within the building happens where you least expect it: on arrival in the second floor’s teaching space. Here, a huge picture window takes up most of the exterior wall; against the deep, inky colouring of the room’s interior the surrounding landscape of ochre and terracotta building tones positively sings, in chorus with the similarly variegated palette of its chairs. Another strategic slice is cut out of a rear wall at the very top of the building, tucked behind the third-floor gallery space. Similar in scale to the teaching room window, it is set close to the floor line, so that the surrounding urban landscape becomes the focus, not the sky. Both in initial design concept and delivered building Sauerbruch Hutton has been keen to articulate and resolve the conflicts and contrasts between this sleek contemporary structure and its mixed urban setting, as well as between the physical materiality of the museum and its ephemeral, digital contents. As the housing for this artefact-free, entirely digital history museum, their building does its utmost to ground the visitor in the here and now. 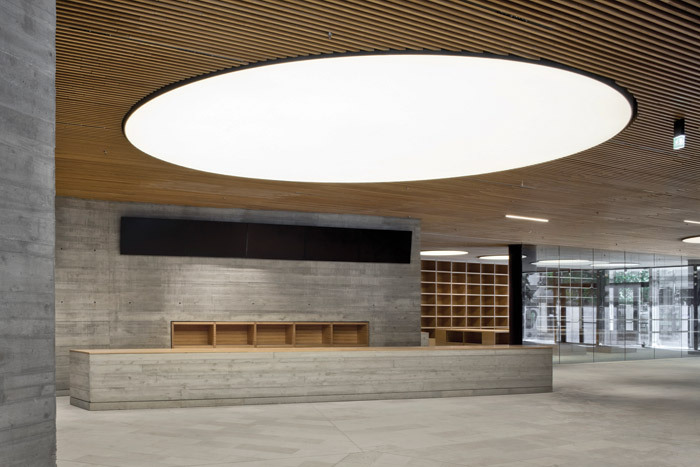 This sensual, tactile counterbalancing is achieved not just through the carefully choreographed vistas both within and beyond the building, but also through the presence of daylight throughout public and circulation areas — waves of light that wash down the concrete walls, casting shadows and patterns that shift according to the hour, the seasons and the weather. These are perhaps the ultimate antidote to the buzzing, shimmering blue light of screens, projections and holograms within the exhibition spaces. 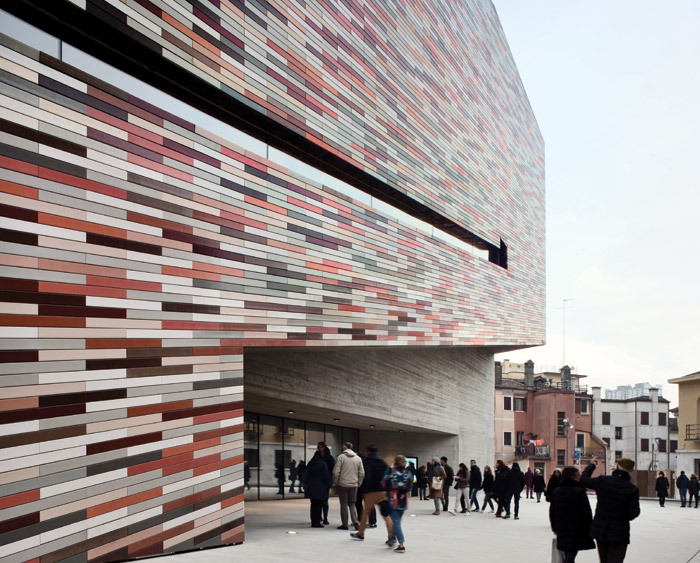 Sauerbruch Hutton tendered for, but could not find an Italian company to manufacture, the tiles which pattern the facades, whose tones are extrapolated from the rich ochres, terracottas, silvers, greys and russets of the region. In the end they were made in Germany by NBK, a company with whom the practice had collaborated before. ‘It was great that we could work with a company who understand that our process is very iterative,’ says Hutton. ‘It takes a long time to work out the glazes, the depth of the glazes, the background colour. So in the end we got a great result.’ She points out how even within the palette of 17 or more colours, there are deliberate variations, where the glaze is thicker or thinner, to generate even more richness to the finished mixture. There are subtle but strategic differences in the ceramics on each building. ‘We were very keen that both buildings are related formally but also in terms of their skin, their appearance,’ adds Hutton. ‘The smaller building, the Administrativo, has richer colours, a stronger mix of reds, fewer greys and softer colours. On this larger building we wanted to have more of the soft colours, the greys and creams and pale pinks, so it would more easily work into the context and put less emphasis on to its bulk.’ The Administrativo tiles are also half the length. Ultimately, perhaps the cleverest thing the architect, the municipality of Mestre and the client team at Fondazione Venezia have done is getting the museum built at all; many grand projects in this region have been commissioned in the last decade and funding allocated — only for it to vanish through an endless leakage of resources via spurious consultancies, dodgy contracts and ‘feasibility studies’. Midway through this project’s gestation, in 2014, the mayor of Venice and 30 associates were arrested on charges of corruption linked to the city’s multibillion-dollar flood-protection scheme. At another point, several of the Veneto’s banks went bust. So it’s no surprise, walking through the freshly occupied museum with Hutton and Sauerbruch that they are so clearly delighted — and perhaps a little relieved — at the quality that has been achieved, from the elegant concrete shuttering to the engineering innovations delivered by Stefano De Cerchio’s team at SCE Project. They were vital in making the wide-open, column-free auditorium possible. A huge column supporting the upper three floors comes down in the middle of the auditorium ceiling, but the loading is transferred to solid steel beams that radiate outwards from that point to frame the auditorium windows. The engineers were also responsible for the ‘structural gymnastics’ that support the aforementioned diagonal window which travels several, uninterrupted, metres along the first-floor stair wall. Achieving a museum of this quality is all the more impressive given that the €110m budget covers the whole 25,600 sq m scheme, which includes the convent and two additional concrete buildings that are designed to fit the footprint and forms of two former stable blocks within the barracks. One houses all the mechanical equipment for the convent’s lifts and ventilation, so that no cumbersome M&E plant had to spoil the historic roofline. The other now houses a cafe. Between them, new routes have been punched through an ancient stable block wall to the relatively recently restored buildings of the Legrenzi square, where now there are small hotels, shops and restaurants.